Amateur Rocket Scientist who pledged he would use his rocket to blast into space in order to prove the earth was flat finally accomplished his life's mission, despite not quite reaching space. 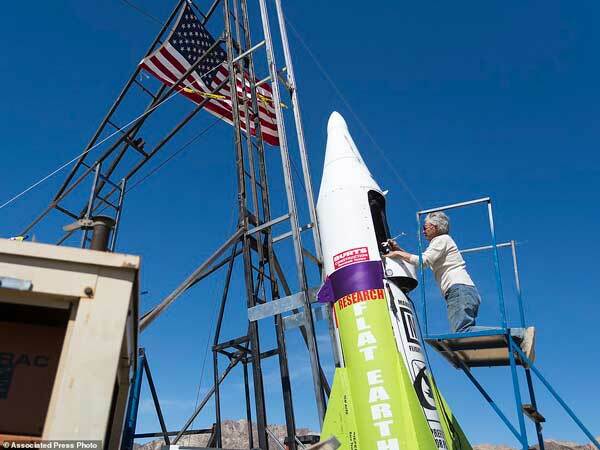 'Mad' Mike Hughes, the rocket man, a self-proclaimed 'flat-earther' launched himself into the sky in his self-made rocket before hurtling back down with a crash. Hughes propelled himself 1,875 feet into the air on Saturday, before spiraling back down into the Mojave Desert. Despite the 'hard landing', Hughes told the Associated Press that he was "ok" despite having an "aching back." "I'm tired of people saying I chickened out and didn't build a rocket. I'm tired of that stuff. I manned up and did it." The launch in the desert town, which was just 200 miles outside of east of Los Angeles, was originally scheduled for November. One Local resident, Mike Diaz, who saw the rocket launch from a distance said: "It was strange to see the launch, it was just a large firework taking over with a big trail of smoke, then it came plummeting back down, I'm surprised he's ok."
The DailyMail reports: It was scrubbed several times due to logistical issues with the Bureau of Land Management and mechanical problems that kept popping up. The 61-year-old limo driver converted a mobile home into a ramp and modified it to launch from a vertical angle so he wouldn't fall back to the ground on public land. 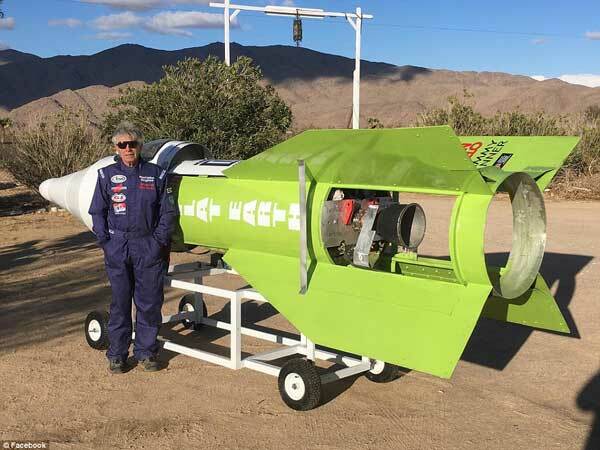 For months he's been working on overhauling his rocket in his garage. It looked like Saturday might be another in a string of cancellations, given that the wind was blowing and his rocket was losing steam. He got permission to launch on the land owned by Albert Okura, who bought Amboy in 2005 for $435,000. Ideally, they wanted it at 350 psi for maximum thrust, but it was dropping to 340. Sometime after 3 p.m. PDT, and without a countdown, Hughes' rocket soared into the sky. 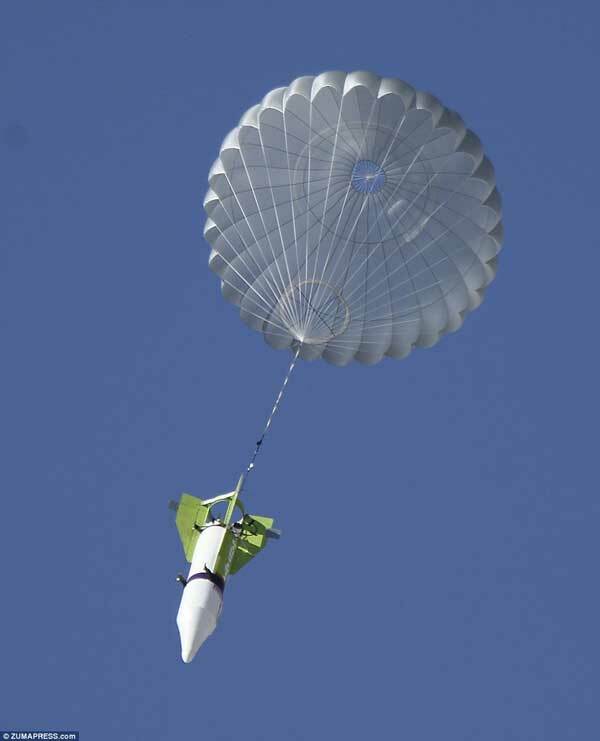 Hughes reached a speed that Stakes estimated to be around 350 mph before pulling his parachute. Hughes was dropping too fast, though, and he had to deploy a second one. He landed with a thud and the rocket's nose broke in two places like it was designed to do. 'This thing wants to kill you 10 different ways,' said Hughes, who had an altimeter in his cockpit to measure his altitude. 'This thing will kill you in a heartbeat. Okura was in attendance and said the event lasted about three to four minutes. 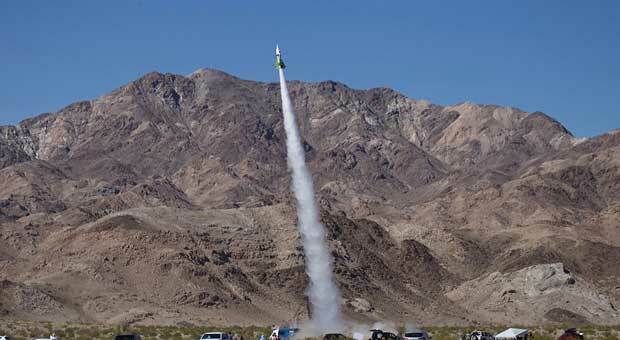 The rocket landed about 1,500 feet from the launch ramp, Stakes said. This has been quite an undertaking for Hughes, who lives in Apple Valley, California. He's seen a flurry of reaction to his plans, with detractors labeling him a crackpot for planning the launch in a homemade contraption and his belief that the world is flat. Some naysayers have posted things like 'He'll be fine' with a picture of Wile E. Coyote strapped to a rocket. 'I hope he doesn't blow something up,' retired NASA astronaut Jerry Linenger said as Hughes' plans captured widespread attention. Hughes often sparred with his critics on social media leading up to the launch, through Facebook comments and a 12-minute video addressed to his doubters. He's always maintained that his mission isn't to prove the Earth is flat. That's his project for down the road. He wants to build a 'Rockoon,' a rocket that is carried into the atmosphere by a gas-filled balloon, then separated from the balloon and lit. This rocket would take Hughes about 68 miles up. He has a documentary crew following him around to record his ambition, with a planned release in August. This was actually the second time he's constructed and launched a rocket. He said he jumped on a private property in Winkelman, Arizona, on Jan. 30, 2014, and traveled 1,374 feet. He collapsed after that landing and needed three days to recover. But there wasn't any footage of him climbing into the craft, leading some to question whether he even took off. This one was going to be shown online through Noize TV. 'My story really is incredible,' Hughes said. 'It's got a bunch of story lines - the garage-built thing. I'm an older guy. It's out in the middle of nowhere, plus the Flat Earth. His future plans are simple: Fill out the paperwork to run for governor.